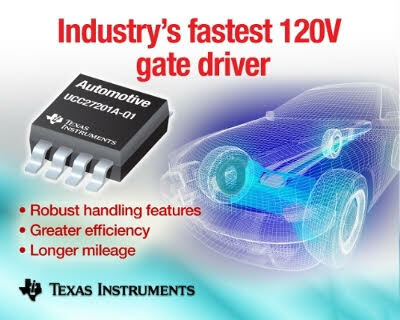 Bangalore, 10 July 2015 —Texas Instruments (TI) (NASDAQ: TXN) today introduced the industry’s fastest 120-V automotive grade half-bridge gate driver with robust handling features. This driver provides a propagation delay at 15ns with short rise and fall times and the tightest delay matching of 1ns for 12-V to 48-V DC/DC power supplies. The UCC27201A-Q1 high-side/low-side gate driver offers advanced noise tolerance, resulting in improved overall system performance for hybrid vehicles. For more details, see www.ti.com/UCC27201A-Q1-pr. The UCC27201A-Q1 is the only automotive gate driver to offer negative voltage handling capability on the high-side pin, making the product more immune to noise. An integrated 120-V bootstrap diode also allows for N-channel MOSFET control and eliminates the need for external discrete diodes. Reduces solution size and weight: Features the industry’s fastest propagation delays at 15ns, faster rise and fall times at 7ns, allowing the system to switch efficiently at high frequencies. This reduces the size and weight of magnetics and heat sinks, ultimately lightening the vehicle load and resulting in longer mileage. Protects the power supply: The tightest delay matching of 1ns protects the power supply from short-circuiting and failing. Reduces cycle-by-cycle switching losses:Improves power-conditioning efficiency and allows the system to switch at high frequencies in hundreds of kilohertz, allowing for smaller system size and weight. Provides advanced noise toleration: The best negative-voltage handling at the switched-node pin creates the ability to tolerate noise, causing virtually no malfunctions in the electronic system. Drives MOSFETs over a wide power range:Allows the use of any MOSFET in multiple power levels. The UCC27201A-Q1 can be used in combination with any digital controller such as the UCD3138, C2000™ LaunchPad™ development kits, ultra-low-power MSP430TM microcontrollers or any analog controller in high-efficiency hybrid systems. Designers can quickly develop and debug applications by using the TINA-TI™ and PSpice models to quickly simulate system performance. UCC27201A-Q1 is now available in the TI store and through the company’s authorized distribution network. The UCC27201A-Q1 automotive gate driver comes in a small-outline integrated circuit (SOIC)-8 package and is priced at US$1.62 in 1,000 unit-quantities. Check out TI’s complete portfolio ofN-channel MOSFET transistors. Visit the TI E2E™ Community Power Management forum to search for solutions, get help, share knowledge, and solve problems with fellow engineers and TI experts.